The marinade, rich in spices and chiles, is really delicious with the tender meat. If you like your food spicy, you can certainly add more chiles. Think about adding some cayenne pepper too, or crushed red pepper flakes. Because this is such a large chunk of meat, it can take the added spices. This wonderful dish should be served with mashed potatoes or cooked polenta to soak up all of the wonderful sauce. Some sliced tomatoes would be an excellent side dish, as would a green salad tossed with sliced mushrooms and an oil and vinegar dressing. For dessert, a cooling ice cream pie or some brownies would be the perfect finishing touch. Combine the minced onion, minced garlic, chile, brown sugar, honey, chili powder, vinegar, cumin, oregano, salt, and pepper in a small bowl and mix. Rub this mixture over all sides of beef brisket. Transfer the rubbed meat to a glass dish. 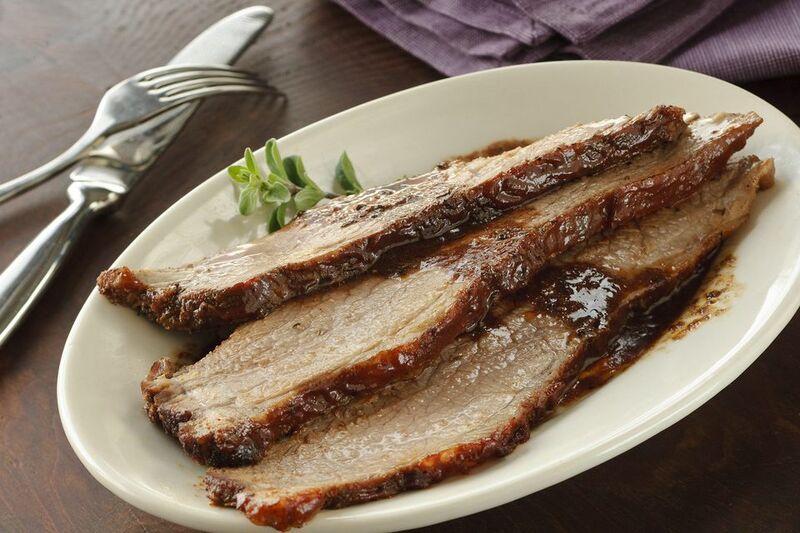 Cover the dish and marinate the beef in the refrigerator for 24 to 36 hours. When you're ready to eat, heat the vegetable oil in a pressure cooker over medium-high heat or use the "brown function" on the appliance. Cook meat, uncovered, for 6 to 8 minutes, turning it carefully, using tongs and a large fork, to brown both sides. Add the canned, undrained tomatoes, lifting the meat to let some of the tomatoes go under the meat. Add the onion wedges to the pressure cooker, then cover the pressure cooker and bring up to high pressure, following the directions for your specific brand. Pressure cook the beef for 1 hour at stabilized pressure. Release the pressure and carefully remove the Pressure cooker lid. Check to see that the meat is tender; it should be after that cooking time. If not, close the appliance, bring it up to temperature at high pressure, and cook for another 10 minutes. To serve, slice the meat across the grain. Serve the pan juices with the sliced meat.